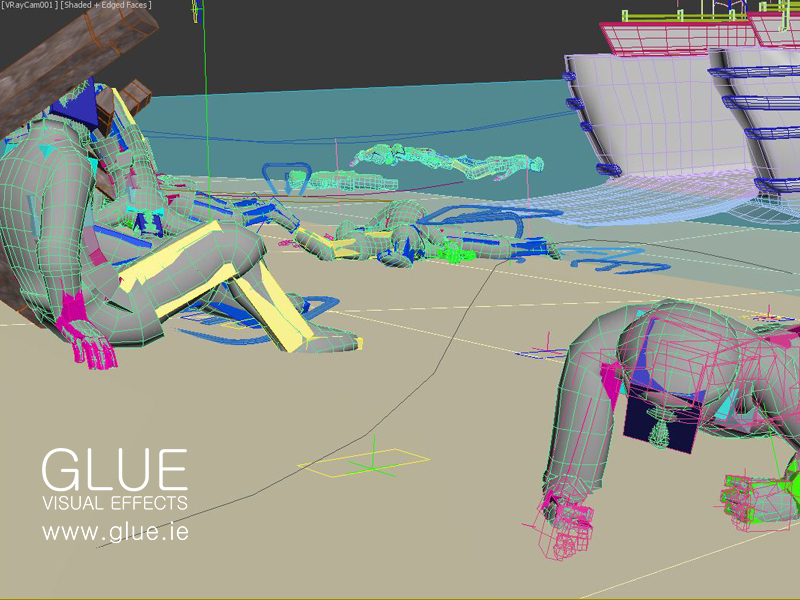 Over the past few weeks the team here at GLUE have been working hard on crowd simulation using digital characters. Crowd simulation is a way of animating large crowds of digital characters or objects, and is used when creating multiple individual animations is impractical and time consuming. For this simulation we are creating a sequence involving a beach landing from a WWII battle. Our main goal was to create a toolkit that would allow us to efficiently generate large groups of characters acting in a believable manner. While our animation team is working on the crowd simulation and animation the modeling team are building assets to populate the scene. Until these props are finalised the animators are using placeholders and once the assets are ready they will be placed in the scene. We will be using one character model to fill the scene. The main focus of this exercise is to demonstrate crowd simulation and animation. Our animators will start by building a walk cycle, this is the most common movement within the scene and nearly every character will walk or run at some point. The animation team create a starting point that all the characters in the scene can use. Later on we will add individual characteristics to the movements, such as different gaits, speeds, limps etc… this will give a sense of individuality and personality to the characters and help to bring the scene to life. To bring realism to the sequence we pay close attention to the references which we base our characters and environments, our artists are looking at films set in that period, pieces of reference such as photos are helpful for posing and seeing patterns in troop movement. Motion capture, commonly referred to as mocap is used to bring an actor’s performance to a 3d character. In the GLUE studio we can capture an actor’s performance. This can be brilliant fun and allows us to transfer this performance into our 3d model and bring the digital character to life. This process allows the team to capture accurate, detailed and minor movements that is otherwise very difficult to depict through traditional means. It enables us to bring real performance and personality to any character. Any imperfections or hesitations in an actor’s movement are transferred to the 3d character along with the choreography that we are looking for. The next step is the clean up process, which can have some issues. At this stage we can remove some of those imperfections and hesitations if they are jarring, but they can also add to the believability of the character so it can be worthwhile to leave some in. Our team want the crowd to have characteristics one would see in a large group of soldiers of that period. They were organised and moved in groups but at times were overwhelmed and chaotic due to the intense resistance they faced during these landings. There are much simpler ways to create groups of rigid individuals but our scene has to have more life than that. 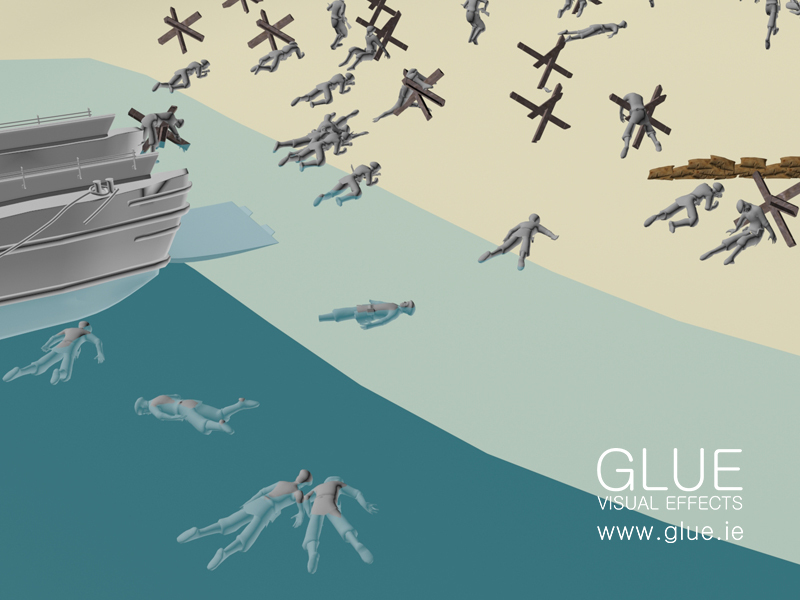 We want to create a dynamic crowd simulation so that the soldiers appear to be acting and reacting in the moment. We assigned different behaviours to individuals to make each one unique. We generated multiple pathways, goals and other objects they could interact with, this gives our sequence that sense of dynamism and life. It’s not just digital human characters we work with, we have also created realistic horses. We did a lot of research on how horses moved and discovered that they have different cycles of leg movement at different speeds. One of the interesting things we learned during this project is that some of the first motion pictures documented animal movement. A man called Eadweard Muybridge was a pioneer in this field and his research is still used by animators to this day! We looked at videos of how horses respond to loud noises and other distractions they would face in a battle. Our team created a walk cycle and a number of run cycles at different speeds for the horses. Then we populated a scene with horses and began to influence their behaviour. Our animators created specific animations of horses rearing up, turning around and falling over and we placed these into the simulation where needed. For other examples of digital creatures, have a look at our blog post on adding hair and fur to cg creatures here. Having this level of control over an animal allows us to create scenes which may be dangerous to record in real life or completely impossible. It allows us to put the health and safety of people and animals first. The finished sequence has many moving parts and is very complex. Crowd simulation is a powerful tool, and there are many ways to do it depending on the type of crowd you are creating and the type and range of behaviour you wish to generate in your crowd.